The POLYWOOD® Vineyard 60" Swing is a great addition to any home as it provides a fun place for the kids to hang out, and it also provides an excellent place for the parents to spend some quality alone time. 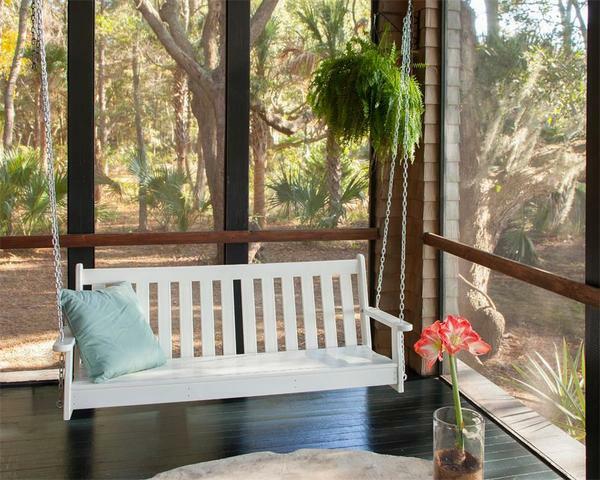 This polywood swing comes in a variety of colors, which means matching is easy for you and the rest of your outdoor decor. Our Vineyard Collection brings a traditional sense of style to your outdoor living space while providing relaxed comfort with nicely contoured seats and well-designed backs - the perfect blend of an always-popular garden look and our PolyWood All-Weather performance. Boxed Dimensions - 57" x 24" x 10"
Boxed Weight - 63 lbs.